By the age of twelve, Susan Campbell had been flirting with Jesus for some time, and in her mind, Jesus had been flirting back. Why wouldn’t he? She went to his house three times a week, sat in his living room, listened to his stories, loudly and lustily sang songs to him. So, one Sunday morning, she walked to the front of her fundamentalist Christian church to profess her love for Jesus and be baptized. But from the moment her robe floated to the surface of the baptistry water, she began to question her fundamentalist faith. If baptism requires complete immersion underwater, what does it mean, if a piece of fabric attached to a would-be Christian floats to the top? Does the baptism still count? In Dating Jesus,, Campbell takes us into the world of fundamentalism-a world where details really, really matter-while wrestling with questions that would thwart any young woman intent on adhering to a literalist religion. If dancing isn’t permitted, what do you do when you’re voted part of the homecoming court? If instrumental music is prohibited inside the church, can a piano be played during your wedding? For a while, Campbell diligently plays by the gender-restrictive rules. She knocks on doors for Jesus rather than preach from the pulpit; diligently guards her chastity, refusing even to date; and memorizes long fragments from the Bible. But her questions continue to surface, and when dogmatic answers from her Bible teachers, family, and congregational fellows confirm that women will never be allowed a seat at the throne, her faith begins to erode. After Campbell flees her church, she remains thirsty for an unwavering and compassionate faith she knows is out there, somewhere. To find it, she returns to the historical roots of religious movements, studies the works of early feminist thinkers and contemporary theologians, and rereads the Bible with the same fervor of her youth. 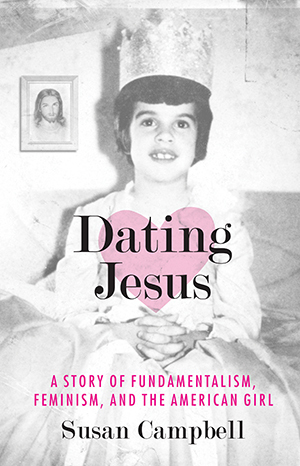 Dating Jesus is a lovingly told tale of how one born-and-bred fundamentalist matured into a feminist while holding onto her sanity and sense of humor. "Few struggles rage with greater intensity than when a person grapples with doubts about deeply ingrained religious beliefs. Wed that to a young woman's need to define her own female identity, in a time when 'Ozzie and Harriet' ran smack into Gloria Steinem, and you get the drama that underlies Dating Jesus." "Campbell’s wry wit and ability to break down Scripture crown her the Sarah Vowell of feminist theology. A must read for anyone who’s wrestled with coming to terms with women’s social roles in her own faith." "Mischievous and fun-loving . . . Campbell's style romps happily from formal where needed to down-home whenever possible . . . Dating Jesus provides the reader with a short history of 19th and 20th century and contemporary feminism, and even ancient woman-positive moments, interspersing all of that with stories of how this American girl discovered that femininity gets an athlete nowhere fast, whereas being tough sometimes brings about a fair shake." "Journalist Campbell's funny, sweet, and yet biting memoir recounts growing up in a fundamentalist church. . . . Campbell writes of trying to be good and gain heaven, but even as a young girl she revels in small acts of subversiveness and continually asks questions that are never answered satisfactorily. . . . Campbell knows her subject well and hopes through this book to keep a dialog open about such issues as the role of women in the church and in the world and to refocus attention upon the teachings of Christ-unfiltered. She notes that Christ's teachings are truly egalitarian in their attitude and 'downright revolutionary.' Suitable for all public and academic libraries." "Dating Jesus contains a number of humorous moments . . . but it also is the story of a young woman 'steeped in the culture of Christ' who begins to have questions about what she has been taught-questions that have no easy answers. . . . Eventually, she concludes that she spent years seeking a relationship with a version of Jesus she didn't believe in." "The book . . . uses humor, history, and memory to great effect in relating the author's personal evolution of faith and politics." "Rarely has a genuine feminist emerged from the modern evangelical movement. An exception is Susan Campbell." "Dating Jesus is a mesmerizing, funny, impressionistic memoir of a spiritual and thoughtful person, one has spent her life wrestling with religion, the meaning of faith and her feelings for the Divine." The devil is in an air bubble floating beneath my baptismal robe. This is troublesome, because I am trying to do the right thing--and, incidentally, avoid hellfire. I have walked to the front of my fundamentalist Christian church this Sunday morning to profess my love for Jesus and be buried with him in the baptismal grave. I will rise and walk anew, a new Christian, a good girl-- not sinless, but perfect nevertheless. But this damn bubble is getting in the way. It is Satan, come to thwart me. I am a fundamentalist. I know that in order to spend eternity in heaven with Jesus, I must be immersed completely in the water, be it in a baptismal font, like this overly large bathtub-type model at the front of my church, or in the swimming pool at Green Valley Bible Camp, where I go every summer, or in a river, or anywhere where the water will cover me completely. I must be buried, figuratively speaking, because that is how Jesus did it with his cousin, John the Baptizer, in the river Jordan.1 It is how I want to do it now. I came to the earth sinless-- not like Catholic babies, who, I’d been told, drag Adam’s original sin around like a tail. Not me. Had I died at birth, I would have shot back to God in heaven like a rocket. But I did not die, and the time I’ve been on earth since my birth I’ve spent accumulating black blots on my soul, like cigarette burns in a gauze curtain. And here Satan has floated up in a bubble beneath the thick white robe, and so I am not, technically speaking, completely immersed. My soul is encased in my body and my body is encased in this gown, and a small portion of it has swollen to break the water’s surface, like a tiny pregnancy, or the beginning of a thought. My head is under. One hand is clenching my nose shut and the other is crossed over my chest, half the posture of a corpse in a casket. But if this dress doesn’t sink with the rest of me, the whole ceremony will be useless. I am a fundamentalist. We worry about such things. A ceremonial joining-together only makes sense. I am thirteen when I decide to make it official. I’d been flirting with Jesus since age eight or so, the way a little girl will stand innocently next to her cutest uncle, will preen and dance for attention with only a dim idea of the greater weight of her actions. I meant no harm. I just loved Jesus. He made me feel happy. In my mind, Jesus had been flirting back, and why wouldn’t he? Our families were close. I went to his house three times a week, sat in his living room, listened to his stories, loudly sang songs to him. Our relationship was inevitable, and it seemed the simplest thing imaginable to declare my love. And so on this bright and terrible Sunday morning I nervously slide out of my pew to walk up the aisle during the invitation song, the tune we sing after the preacher gives his sermon. The invitation song is a time of relief for those who think the preacher has gone on too long, and a time of trepidation for the sinners who are paying attention. Although the song varies depending on who’s leading the singing, all the invitation songs share a tone of exhortation firmly grounded in fear, meant to shake a few of the ungodly loose from the trees. And I am a sinner. I know that as assuredly as I know Jesus loves me. I am trying to live my life to meet the impossible ideal of perfection set for me exactly 1,972 years earlier by my boyfriend. The Bible said Don’t lie, but I lie several times a day. The Bible said Don’t steal, but I copied from a friend one morning in social studies because I hadn’t taken the time to do my own homework. The Bible said not to lust, and while I am not clear what that means exactly, I harbor a deep and abiding crush on a series of pop culture icons from Bobby Sherman on--save for Donny Osmond, because he is too Mormon and I don’t think I could convert him. But Donny is the only one from Tiger Beat magazine for whom I have no tingling feelings. I know, even though my church would frown on it because none of these boy-men are members, that if any of them save Donny drove up in a jacked-up Camaro and honked the horn, I would hop into the front seat without a look back. Oh I sinned, all right. It is all laid out for me, both in the Bible and in the talks our Sunday school teachers give us. I know my future as I know the St. Louis Cardinals lineup from the tinny transistor I sneak into my bed on game nights: Bob Gibson, Ted Simmons, Matty Alou, Lou Brock, Jos? Cruz, and the man who will ultimately betray my faith in baseball and become a hated Yankee, Joe Torre. Those Cardinals will win the pennant one day, but I will be a Christian today. The sanctuary in which I walk is a high-ceilinged, cavernous room covered completely--walls and ceiling--in knotty pine that holds my secret sin. When I am bored--and during three-hour Sunday-morning services I am often bored--I attempt to count the knots in the panels behind the preacher. I lose count and start again, lose count and start again. I feel guilty about that, but I am sitting through three sermons a week and once I recognize the preacher’s theme (sin, mercy, salvation), I start counting knots. The room seats roughly seven hundred souls. I say roughly, because we never fill it. It was built amid much discussion and hard feelings at a time when my church was among the fastestgrowing Christian groups in the country. Of course we would fill it, we told one another, even if our regular Sunday-morning attendance hovered around three hundred or so. God would provide. We just needed to have the right amount of pews. The interior looks as we imagine the ark of Noah would look--spare, with not one cross on display. Jesus hung on a real cross. Who were we to use the emblem of his shame as decor? And why would we, as girls, wear small golden crosses when the real one was so much bigger and uglier4 The pews are padded--another discussion--and there are no prayer benches, for fear that they would put us in company with the Catholics. Still, I never once saw someone drop to his or her knees during public prayer. We are, one visiting minister derided us, the only group of believers that sits to sing and stands to pray. In fact, the building was built on prayer--and a painful schism. When you believe you are holy and have God on your side, you easily cross over into being dogmatic. We split over paving the parking lot. The anti-paving bunch argued that Jesus never walked on pavement, and that we shouldn’t be so fine-haired as to worry about muddying our good shoes as we scrambled to our (padded) pews. And besides, the money could be used for a greater purpose--namely, saving souls. The grandparents of this crowd had cheered at the outcome of the Scopes Monkey Trial. Consider them opponents of creeping and sweeping modernity. It would be my family’s one concession to change. Among the literal-minded, schisms are just waiting to surface, ready to crack open at any moment. Elsewhere, the other churches of my faith--we had no central hierarchy, opting instead for home rule by a group of older men, the elders--would split and split again, over adding a pastoral counseling service, or a daycare center--more modernity, in other words, but that was later. For now, we felt the sheep were scattered, and when we brought them home, they could clatter across pavement to sit in padded pews and partake in the liquid part of the Lord’s Supper from tiny shot glasses meant for just such a purpose--and likely to form a barrier against the common cold as well.